I’m not a fan of Winter – I much prefer the promise of Spring, the warmth of Summer and the colours of Autumn. If I had my way I’d move us all to the Southern Hemisphere for three months and then return once the greyness has lifted. However, this not really being practical (though I’m sure it could be possible if we really put our minds to it), we’ve created and developed plenty of wintery and Christmassy traditions over the years to help us through. In fact, I didn’t realise quite how many we had until I started putting this list together! And so, despite Christmas only being a week away and us being almost a third of the way through Winter already, here is our Winter Bucket List in all it’s glory. Each year I try and introduce something new for us to do together as a family. 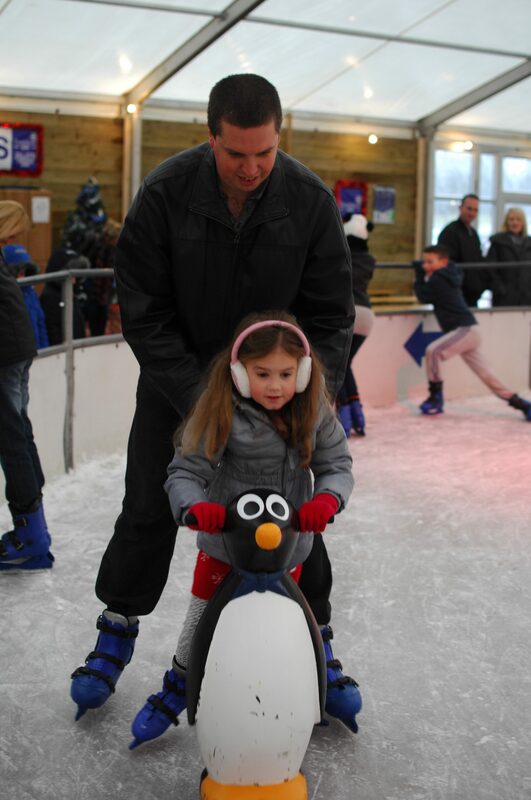 Last year we took the girls ice skating at Trentham Ice Rink and it was brilliant! When I was a kid I used to go ice skating at weekends with my Dad and Stepmum at Queensway Ice Rink in London and I absolutely loved it; the husband used to go to Telford Ice Rink quite regularly as a boy and the girls had been begging us for ages to take them. The husband and I were VERY out of practice, though he quickly got back into the swing of things whereas I took a bit longer. The girls thoroughly enjoyed themselves and the penguin sliders were a godsend. This year I’d planned to take them for their first ever visit to the pantomime, but I think I’ve possibly left it a bit too late to get tickets so I might save that for next year instead. One thing we are definitely going to do for the first time this year is go to a village near us who are famous for their Christmas lights. Every year all the families in the village decorate their houses with as many Christmas lights as they can and people visit from miles around to see the spectacularly impressive displays. It’s all done to raise money for local charities and I’ve been wanting to go ever since we moved up here eleven years ago – I’m determined that this year we’ll actually get there! No Winter Bucket List would be complete without a visit to Santa! Isn’t it great that he travels to so many different places so all the children get the chance to see him? Last year we went to Blithbury Reindeer Lodge for their full-on Christmas experience – we went to Elf School, met some reindeer babies, had a ride in a real sleigh pulled by the reindeer, decorated gingerbread biscuits, had a story read to us as we sipped hot chocolate by a roaring fire, and visited Santa in his grotto. It was a pretty wonderful day (expensive, but worth it for all the things you got to do) and the girls still talk about it now. This year we’re planning to go to Trentham Gardens to see Santa. When you have three children all at school it means that there are just over ninety Christmas cards to write 😮 I’m very thankful that they’re all old enough now to write them all themselves with minimal supervision. We try and get it all done in one sitting, with Christmas music on in the background and its probably the first Christmassy thing we do after Ella’s birthday in the first week in December. We always wait to put up the Christmas decorations until after Ella’s birthday as well – letting her have her day full of balloons and cards and presents before we transform the lounge. We have a little tradition of buying a new decoration for each of the four girls every year which has their name on it – trickier than it sounds even though their names aren’t that unusual! Sometimes my Mum gets it, sometimes I do and it’s something we look forward to every year. Every year the girls eagerly await their message from Santa. Even Mimi, who is adamant that she doesn’t believe in Santa, sits spellbound at my laptop as he talks to them through the screen. 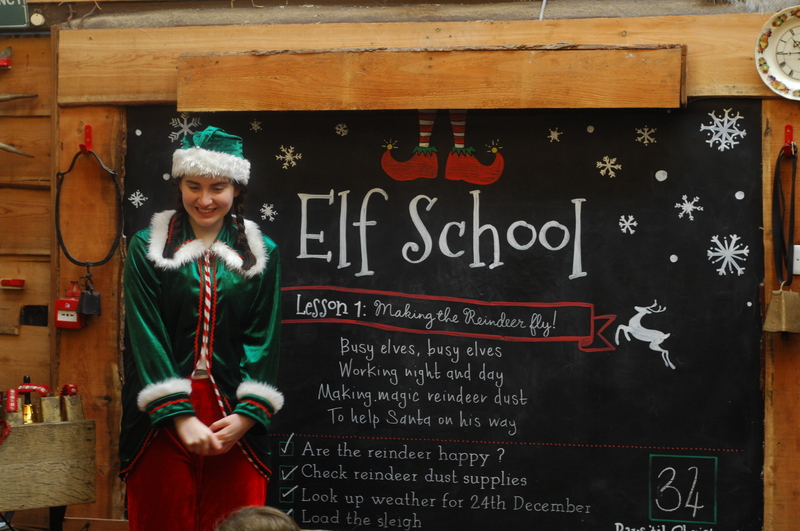 If you’ve not come across it before do go and check out Portable North Pole for some extra magic for your children. Last year we also tracked Santa on his journey around the world via NORAD – it’s pretty cool being able to see whereabouts he is in his sleigh as he zooms around the globe! This is one of the highlights of the school year for me – I absolutely love the school nativity play and I’m more than a little bit devastated this year as it’s the last time that any of our girls will be a part of it as our school only does it up to Year 2. Each of the girls have played different parts over the years – we’ve had camels, angels, sheep, mice, owls, narrators and Mary and whether they’ve had a speaking role or not it doesn’t matter – they sing their hearts out and give their all in every performance. It never fails to bring tears of happiness to my eyes. Over the last couple of years we’ve made a batch of gingerbread (with mixed success each time!). Last year we bought a gingerbread house decorating kit to try out and it was loads of fun. I’ve bought another one this year for us to do over the holidays as it was such a hit. It wouldn’t be Christmas without a bit of novelty hat, silly glasses and Christmas jumper fun. I’ve resisted buying a Christmas jumper for years but decided that I may as well join in the fun and so have invested in one this year that lights up – I figured I may as well go all in if I’m going to do it! I love this photo of my little tribe from last year – I can’t wait to get a similar shot this year and see the differences in how much they’ve changed and grown. Every year St Mary’s Church in our town centre hosts a four day Christmas Tree Festival, where local businesses sponsor and decorate a tree. I’m not religious in the slightest but I do love visiting churches – there’s something so peaceful and serene about them. This church in particular is incredibly beautiful inside, with stunning stained glass windows, an impressive organ and gorgeous architecture. When it’s all lit up with the soft glow of the colourful fairy lights on the trees and the choir is singing traditional carols, it’s one of my favourite places to be. Sadly we didn’t make it this year – we went on the last day but didn’t realise it closed at 2.30pm instead of 4pm and so we missed it. We’ll be there next year for sure. Bad planning on our part – Ella’s birthday is at the start of December, the husband’s is five days before Christmas and Lola’s is just after New Year – so this time of year is pretty full on with regards to our social calendar, stressful in terms of thinking of presents to buy (and supplying wish lists to both sets of grandparents!) and a bit of a strain our financial reserves! I do love this month of chaos though as it is lots of fun, even if the house does permanently look like a bomb has hit it with presents hidden around every corner, balloons underfoot and hyperactive children creating mess wherever they go! In my world there is nothing better than a long walk in the forest breathing in the cold crisp air and clearing away the cobwebs from too many late nights spent wrapping presents. The suggestion is usually met with grumbles from the girls, but once we manage to get them out of the house they love it, especially with the promise of a hot chocolate to warm them up from the inside out once we get home. Sophie always spends Christmas Day with her Mum and Stepdad, so we usually have her to stay for a few days in between Christmas and New Year. Likewise my Mum and Stepdad come to visit for a day as well and I usually do a big buffet of food and we exchange more gifts between us all. I kind of love this as it means that the festivities get stretched out beyond a single day and we get to spend some quality time with them all as the overwhelm of Christmas Day itself and all it’s excitement has already been and gone. When I was little I did the same thing – spent Christmas Day itself with my Mum, my Nana and Grandad and my cousins, and then had a separate mini-Christmas with my Dad. We’ve not had enough snow to do this for a couple of years now (a part of me is very happy about this as I really hate snow! ), but when we do have a good snowfall the girls and the husband LOVE going out in the garden to build the biggest snowman they can manage. Christmas Eve wouldn’t be complete without leaving out a snack for Santa and his reindeer. Mince pie, milk and a carrot are the order of the day in our house, though when I was a girl it was a mince pie and a glass of sherry at my Nana and Grandad’s house. 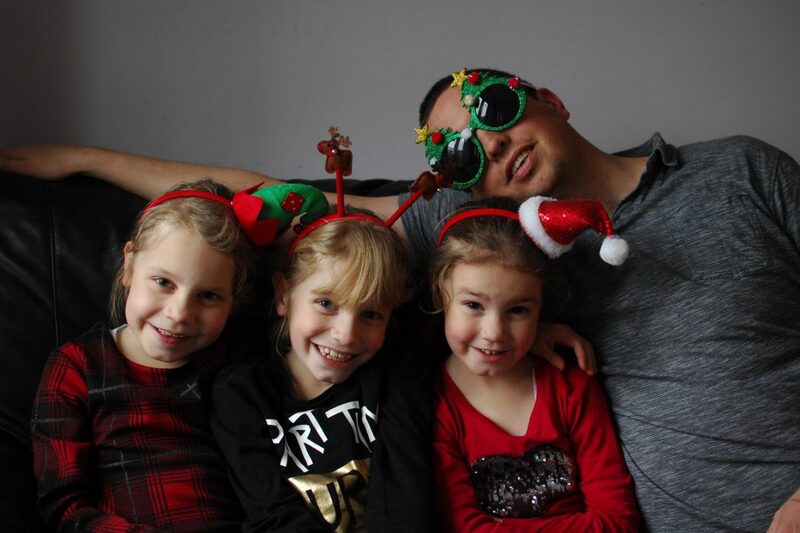 On the big day itself we get up, get dressed and have breakfast before opening presents – I try and make the girls wait until mid-morning otherwise it’s all over in a flash! Then it’s playing with their new toys, phoning family to wish them a happy Christmas and say thank you for the presents we’ve received and some good old fashioned board game fun – Pie Face last year was a definite favourite! We eat our Christmas dinner at about 5pm and then watch a film together before the girls go to bed.